By offering the clothing, accessories and lifestyle that hockey fans crave, this company slammed the biscuit in the basket. A keen hockey player for most of his youth, Ger McNamee grew up in Ottawa with an insider’s knowledge of the sport and the people who play it. That proved a key advantage when McNamee and partner Craig Kennedy launched a company selling hats and other apparel for fellow hockey enthusiasts back in 2002. McNamee was only 22; sales happened from the trunk of his mom’s old Mazda after games, and marketing happened through word-of-mouth. But they kept at it and their company, Gongshow — the name is proudly emblazoned on their products — now has worldwide sales and a major following on its social media feeds. This Gongshow video features Bobby Ryan of the Ottawa Senators® and Claude Giroux of the Philadelphia Flyers® in a friendly competition: shooting pucks at fruit, a drone and other objects… to make them explode. It received over a million views. Privately held Gongshow Gear Inc., which was a 2016 Canada Post E-commerce Innovation Award finalist, is headquartered in Ottawa, and has about 30 employees, including a small group in China that works with manufacturers there. Manufacturing is also done in Peru and Canada. The company was originally conceived as a hockey lifestyle brand, to be worn on- and off-ice by players themselves, and it helped that Gongshow was quickly adopted by friends of the founders, many of them Junior League and NHL® players. 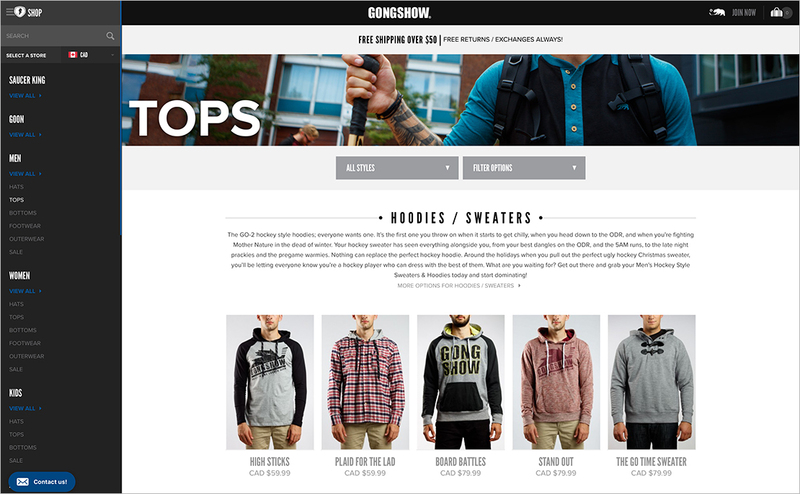 Some Gongshow sales have always come through traditional retailers, but a major slice also comes from the company’s website, where customers have access to the full range of products, from toques and jerseys to jeans designed specifically for hockey player physiques. “I think we have established ourselves as a leader in our category,” says McNamee. Like many ecommerce retailers, Gongshow Gear relies heavily on social media to build awareness but it has found the most success with YouTube. The company puts out a steady stream of hockey-related videos that are almost unfailingly original and adored by its customers. Most important, the company speaks the language of hockey. Recently, the company put up a video featuring two NHL® players, Bobby Ryan of the Ottawa Senators® and Claude Giroux of the Philadelphia Flyers®, in a competition (see above). The goal was to shoot pucks at fruit, a drone and other objects, and make them explode. It received over a million views. “This is how our customers – particularly the 14 to 25 age group that is our core demographic – want to absorb content. They don’t want to read blog posts, they want to scan through their social media feed and see one of our videos,” says McNamee. And the videos aren’t necessarily about selling anything. They’re about telling stories that showcase a love and appreciation of hockey and promote the Gongshow brand. The fact that Canada is seen around the world as the epicentre of hockey means that enthusiasts who live in other countries, and perhaps don’t understand English, will still buy the product simply because they love the sport and want to send that message. Written by Toronto-based writer and producer, John Greenwood. © NHL 2017. All rights reserved.